Go ask Long Island lobstermen … if you can find any … what they think about climate change. Trouble is, there aren’t many left because there aren’t many lobsters left in Long Island Sound. Same thing with Atlantic cod fishermen. There aren’t nearly as many boats targeting cod compared to 25 years ago because there are fewer fish. We can blame climate change to a degree. No, it would be shortsighted to blame all fisheries depletions on warming waters. Myriad factors including fishing pressure can conspire to harm stock health. But a new study from NOAA underscores a concern many scientists and fishermen share: ever warming waters will continue to dramatically impact fisheries. Published in the journal PLOS ONE, the study relies on a new methodology to look at how 82 species in the Northeast region have been and will be affected by climate change. Specifically, the study measures which species will be most vulnerable to climate change effects, including ocean acidification, as well as which species’ migratory patterns will most likely change because of ocean warming. 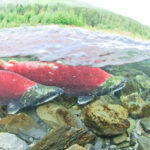 In a nutshell, species that live along the ocean floor such as cod, mussels and lobsters, and those like salmon and sturgeon that migrate between salt and fresh water are most at risk. Some of the species’ responses we already know. As the Gulf of Maine warms faster than 99% of all ocean climates on earth (at a rate of a half a degree Fahrenheit increase per year for the past decade), several native species have reacted. Lobsters have moved north and east along the coast, leaving fisheries in Long Island and Cape Cod in succession. The Northern Shrimp fishery has collapsed in the past few years. Scientists speculate the combination of warming waters limiting spawning and reducing the amount of plankton the shrimp eat is largely to blame. Scientists also say these warming waters limit cod reproduction and health and survivability of juveniles. 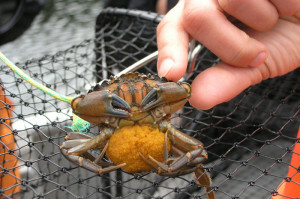 Gulf of Maine temperature increases have opened the door to invasive species like black sea bass and scup, and have made bays and estuaries more hospitable to European green crabs, whose numbers have risen exponentially in the past few years. Green crabs wreak havoc on eelgrass flats as they burrow in to eat larval mussels, clams and oysters. 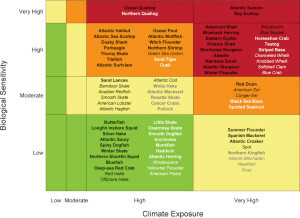 Jon Hare, a fisheries oceanographer at NOAA Fisheries’ Northeast Fisheries Science Center (NEFSC) and lead study author, said the main purpose of this study is to give fisheries managers and other stakeholders tools to take climate change into account when devising management policy. “We’re never going to have perfect information,” he said. “The ecosystem is going to change because of a combination of anthropogenic influence such as greenhouse gas and natural climate variability.” To keep up with the pace of that change, which has been dramatic in the past 10 years, Hare and his colleagues developed a methodology that incorporates already established research and factors in expert extrapolation. This methodology helps them predict things like how mussels will respond to warming waters or how they will react to increased acidity in their ecosystem in the next 10 years. The scientists graded each of the 82 species’ vulnerabilities taking into account different variables, and set those grades to peer review. The result is a composite view of how likely a species may suffer reproductive pressures from increased temperatures or how likely a species may change migratory patterns. Hare said other studies are beginning in the Bering Sea and off the coast of California, and the National Marine Fisheries Service wants to conduct these studies on all U.S. coasts. No doubt much discussion will arise from this study and others like it. Some will question the study’s approach, efficacy or even need. 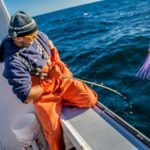 Some fishermen may view the study as simply another tool for regulatory bodies like the New England Fisheries Management Council to further restrict fishing without real stakeholder permit. Others might ask why this hasn’t occurred before. I see a couple of potential positive outcomes. First, the fact that NOAA is not only acknowledging climate change, but also actively trying to take steps to factor that into management decisions is significant. Like any federal agency, NOAA moves at a glacial pace (I wonder how long we’ll be able to use that descriptor…). But Hare and his colleagues eschewed the traditional approach to ecosystem-based management via species-specific analyses, which could take decades, to adopt a faster, potentially more efficient methodology for studying the issue. This is largely because climate change has been transforming ecosystems faster than we can study them. Secondly, Hare says he hopes this tool becomes iterative — that in fact it will adapt as ecosystems change so scientists and researchers will have a chance to keep closer tabs of impacts than before. Some of fishermen’s frustrations with past NOAA research/policies is that that they are static, and don’t change dynamically with ecosystems. But Hare hopes the iterative process for this methodology will take into account fishermen input when considering which species may be affected by climate change. “Fishing communities will be impacted as well,” he said. One impact is that some of these communities will start adapting to the changing marine ecosystems and harvest “locally abundant” species that were once considered invasive species. 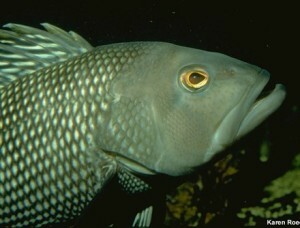 For example, black sea bass have started showing up in lobster traps in Maine because they’ve followed the warming trend north. Now they are an available seafood choice in local stores and restaurants. I too hope this process becomes more collaborative. Because without that interactive participation in the science and policy making, the process will continue to be viewed by many as a set of unilateral decisions curtailing fisheries at the expense of small scale fishermen. As Hare said, even if we magically stopped all green house emissions now, the lingering effects of warming oceans would continue for decades. Acting now, collaboratively, is the best chance at present for ensuring we effectively manage fisheries even as warming waters seek to change the dynamics. I attended a workshop a year ago in which scientists (including Hare), fishermen, and policy makers discussed how to better predict climate change impacts on fisheries and how to communicate that to fishermen. Perhaps this is the first step. The One Fish Foundation presentation was informative and sparked my students’ natural curiosity. 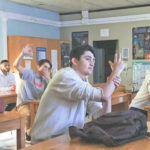 Through the use of visual images, charts, and hands-on experiences, students learned about specific fishing practices and how they affect the fish population. 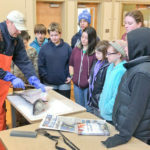 Students learned to identify sustainable fishing practices and to be educated consumers who ask their local fish providers questions to discover the origin of the fish that will end up on their table.